This is the second of three School Board candidate recommendations I’ll be making. Absentee ballots should be arriving any day for the Aug. 28 primary, if they have not already. If you care about the future of public education in Polk County, in Florida, and in the country as a whole, it’s time to pay attention. This is the most pivotal Polk School Board election since I moved to Lakeland as a young reporter in 1999. Two multi-term incumbents are not seeking re-election. The third faces a strong challenge. Change is coming. What kind of change do you want? Earlier this week, I wrote about my support for Lisa Miller. Later this week, I’ll be explaining my support for Sarah Fortney in District 3. Today, we’re focusing on Jennifer Sabin for School Board District 5. The District 5 race for Polk School Board offers the clearest choice between the past and the future. It’s the only race with a long-term incumbent, Kay Fields, who is seeking a fifth term. Jennifer Sabin represents the future. If you want something new and creative, Jennifer is your choice in this race. Click to enlarge this excerpt from her mailer, including her strong endorsement from Polk’s 2017 Teacher of the Year, the dynamic Lois Horn-Diaz. Like Lisa Miller in District 7, Jennifer brings the two broad qualities that I see as vital for a very good School Board member. Jennifer has a core expertise in a vital subject matter area. She is one of the state’s leading non-governmental experts/advocates for testing and assessment reform. If you want a candidate with the understanding and will to push back on destructive high stakes standardized testing and excessive assessment, Jennifer is your candidate. I can’t wait to work with her to come up with human-centered alternatives. Jennifer also brings a fundamental curiosity and creative problem-solving energy that has been lacking from elected Polk School Board oversight for a generation. Please see this decade-long timeline if you need evidence of the organizational culture costs of a distant and incurious board. The second part is particularly important in this race. I’ll explain why in a moment. [Jennifer] is running for the seat because she is passionate about improving the education experience for students, teachers and parents. Respect teachers through proper support, training and honorable negotiations. Build a stronger relationship between board members and the community through public comment, community events and site visits to schools. Believe in the value of a free and appropriate, high quality public education for all students, regardless of abilities, socio-economic status or location. Sabin wants to make sure the district and local schools retain as much autonomy as possible so students are served in the way that best meets their needs. In addition to too much standardized testing, the problem also is rooted in a lack of respect toward professional teachers, who have seen their autonomy slowly removed over the years. Sabin is an active education advocate. She is the coordinator of Opt Out Polk County, which is part of the Opt Out Florida Network, a community of people who oppose state-mandated standardized testing. 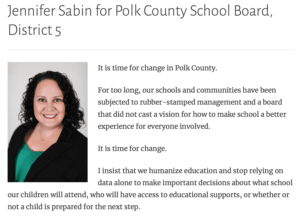 Sabin also has vocally opposed non-mandated tests the Polk County School District used to evaluate teachers. Jennifer also has a strong social media presence on Facebook, where she does much of her writing. Check her out there. Jennifer’s work and pressure, along with many other activists, has helped put overtesting as a policy on the defensive, in Florida and Polk. It contributed to elimination of many absurd “End of Year” tests in place a few years ago. But we still have work to do; and Jennifer’s encyclopedic knowledge of assessment/test law and practice will be a powerful asset. Like Lisa Miller has with Exceptional Student Education, Jennifer has been a valuable resource to me in understanding testing policy and alternatives. And I have sent many people who object to high stakes standardized testing to her to consult on how best to legally and ethically minimize the impacts of misguided testing on their academic and human lives. I don’t think I’ve ever heard Jennifer raise her voice. She’s exceedingly measured and polite in her interactions with people — bookish and academic, almost, I would say. But her questions and insight pierce the complexities of any discussion. There is content in everything she asks and says. I know; I’ve had the experience of not being able to answer her excellent questions before. It’s a sheepish feeling that makes me want to do better. Jennifer’s background is in writing and teaching language arts. So it’s hardly surprising that she’s an excellent written communicator, in multiple forms. She’s attended many of our School Board work sessions and meetings and created various written accounts of them. On many occasions, she’s live-Tweeted events during meetings. And it never fails to impress me how effectively she hones in on what’s important and how concisely she describes it. That’s good writing and good fact-finding. It makes outstanding and productive oversight. And that kind of board oversight is a major issue in this race. I’m writing this the day after one of the most productive and encouraging School Board meetings we’ve had in a long-time. This article is about Jennifer, so I’m not going to detail everything here. But I saw real signs of organizational progress, developed by senior staff, in: reforming how HR functions, building a modernized web presence that engages the public; responsiveness to community needs through staffing; very productive collaboration between management and labor in really hard insurance/compensation negotiations; scrutiny of contracting; and some very positive steps toward building lasting partnership and common purpose with Lake Wales. This came the day after the graduation of our first class of school “guardians,” a compromise plan for security that has become a model for the state in how to address the new state law about security within a population that really has no consensus about how to do it. In short, I see real, staff-led effort toward making us a better employer and public institution. I see attention to problems. I see some evidence of productive self-criticism. It’s no secret that we had a very difficult meeting on June 24. A lot came to a head. And we’re not fully clear of it. But since that meeting, I’ve been extremely pleased with the direction and responsiveness of district staff leadership. And I absolutely believe that the intensity of purpose and productive scrutiny that the public demanded in 2016 is starting to pay off. Jennifer was an important part of that effort in 2016 and has remained active ever since. As a 2018 voter, you have to decide for yourselves how much of that potential progress cited in the last two paragraphs — and more — would have happened organically without the constructive pressure, intensity, and attention to detail you demanded in 2016. You’ll have to decide what will happen if the intensity wanes. And we still have so so so much to do. And again, you have a very clear choice here about who is most likely to keep this aircraft carrier turning and point it toward new horizons. Jennifer offers a generational change in the board’s approach, one that will complement that organizational changes beginning to emerge. Again, her measured demeanor belies a fierce independence and courage. After all, she has stood up to the full might of Florida’s testing pressure for years without blinking or giving an inch — or raising her voice. You can expect that same quiet intensity of purpose in building a better future as a board member. See below for my other endorsements as I finish them.